The 2014 NFL Draft is fast approaching. A substantial pool of gifted players will be showcased throughout the evening. The annual event will take place at Radio City Music Hall on May 8, 2013 in New York City. There are a number of prospects who will make significant impacts on teams deciding to draft them. Quarterback will be the focal point of the first ten choices according to draft experts. Players such as Teddy Bridgewater, Blake Bortles and Johnny “Football” Manziel are being viewed as franchise changers. To have a successful NFL franchise, each team must possess a difference making Quarterback. In Foxboro Massachusetts, the New England Patriots are in a position of luxury. The team has maintained a level of success as an annual Superbowl contender. Tom Brady is a two-time Most Valuable Player (MVP) and three-time Superbowl champion as a member of the Patriots. The Quarterback position in Foxboro is completely solidified for the next three years. Tight End use to be a position of strength for the Patriots. The unfortunate incarceration of former Patriots Tight End Aaron Hernandez and constant season ending injuries to All-Pro Tight End Rob Gronkowski have literally factored into the Patriots season ending prematurely. 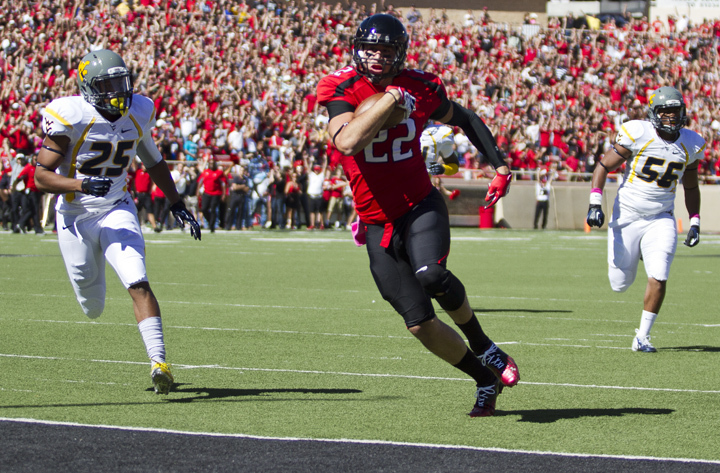 New England can remedy their situation by drafting Texas Tech’s Jace Amaro. Most draft experts project the Patriots will draft Amaro with their first round pick at 29th. Amaro would fit perfectly in a Tom Brady lead offense because Patriots Offensive Coordinator Josh McDaniels centers it on two Tight End sets. Not to mention, Jace Amaro practically has the same measurments as Gronkowski. He stands 6’5 and weighs 260 pounds, with excellent pass catching skills. The talents he showed at Texas Tech were worthy of Gronkowski comparisons. Amaro was an All-Big 12 Conference 1st teamer in both 2012 and 2013. He holds the NCAA Division 1 record for most receiving yards per game by Tight End in a single season. The standout game of the season for Amaro occurred on November 2, 2013. In the lost to Oklahoma State, Jace Amaro had a performance that rivaled his professional counterpart. (Rob Gronkowski) He concluded the game by catching 15 receptions along with 174 receiving yards and a touchdown. The Patriots and Jace Amaro would be a perfect match for both parties. Amaro would provide the Patriots with another high quality player to be used in their offensive system. Rob Gronkowski is not expected to play again until October or November because of last season’s anterior cruciate ligament (ACL) injury. Under these circumstances Amaro can step in and develop a high level of chemistry with Tom Brady and the New England Patriots offense. Imagine a Patriots offense with two Rob Gronkowski’s? The NFL and all 31 teams would surely take notice. On May 8th the Patriots can begin the process of making this a reality, by using their 29th first round pick to draft Texas Tech’s Jace Amaro. Well written. Good luck to the Pats, though I’m interested on your take on what my Packers need to do in this next draft.